As originally conceived by Barry Fleming, the floor was to be permanently attached to the body sides and so too were the lower roof sections. The only access internally, therefore, was to be the clerestory roof/sides to the centre of the roof. In addition to being very restricted, over time there was a little distortion of this section relative to the more chunky body, such that it has developed a bit of a bow – see the final picture of this post. I have been building a few coaches of late and have arrived at the view that it is desirable to have the underframe detachable from the body and if at all possible the roof too. In this case, I am going to give up making the roof detachable but will keep the underframe as a separate piece and arrange for the floor and interior to slide out of the body. In order to provide a mount onto which I can secure the securing bolts to retain the two parts together, I came up with a metal bracket that has been glued into the coach vestibule where it is hidden as below. With this completed, I turned my attention to the bogies. 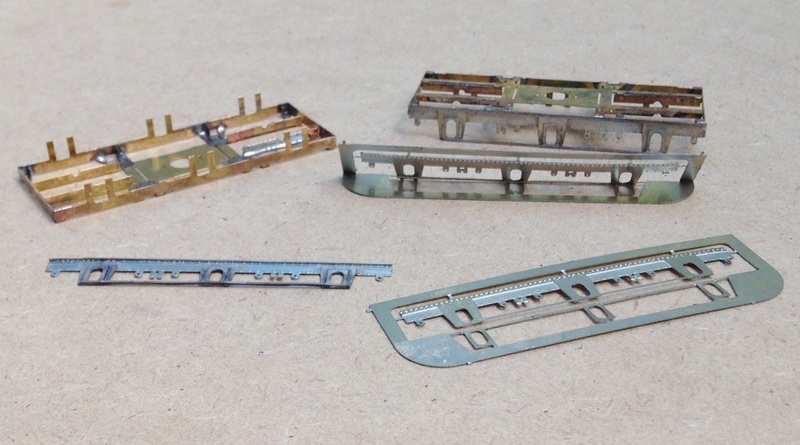 These are based around the Bill Bedford sprung bogies, now supplied by Eileen’s Emporium – there is one with the right dimensions for the ECJS bogie. These are only the sprung assembly and offer no detail of the real bogie at all and these were quite characteristic riveted plates. I am not aware of any offerings from the trade for these, so I have had to create my own – out comes the CAD machine again! Actually, they are quite easy to draft and there was a fairly good drawing available. As with some of my other etch designs, I have used folding jigs to ensure that the layers come together correctly without bother. In the photo below you can see the basic Bill Bedford sprung frame on the left upper, the basic etch to the bottom right and the finished side with the layers laminated to the bottom left. And this is a close up of the bogie sides fitted and some of the brake hangers fitted. After searching around, I decided that the best means of making the axleboxes and springs was to use the Drummond pattern axlebox/spring assembly from Lochgorm Models. These are really nice but the springs are too long such that the hangers are a bit far out for the six wheeled bogie – hence I formed a hanger point as part of the etching, which you can see yet to be folded down on the above picture. The intention will be to insert a brass rod through the hole in this and to then mount small washers on it to give the impression of the springs. 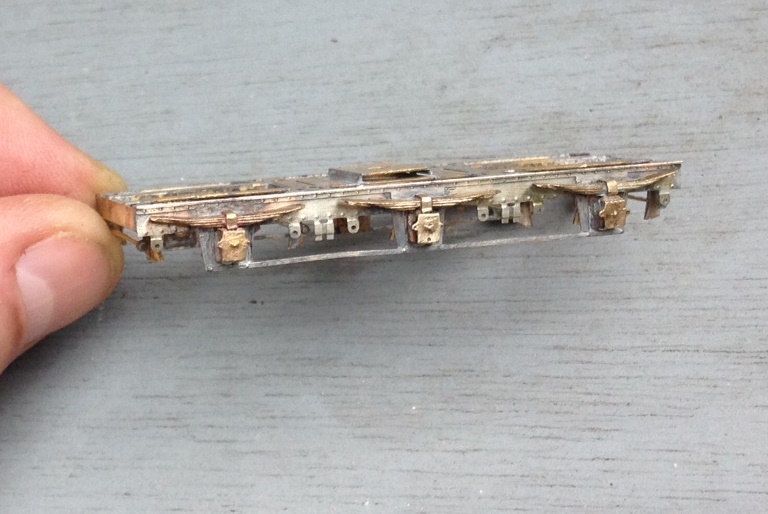 A similar rechnique is used on some of the 5522 models bogies and is quite effective. With this representing the hangers, those to the casting could be cut away. The axleboxes are rather nice, as you will see, and are of cast brass. The bad news about this is that they are really hard and quite a lot of work is required with a dental burr to open out the rear to be free of the bearing. And a look at both bogies together, now with the bearing spring hangers in place along with the brake hangers and rods. There are other things to do with the coach; the centre part of the roof has a bow, there is various detail missing from the underframe, roof and ends yet to go – but it does look the part doesn’t it? In response to the first part of this blog, Bill Bedford did contact me to help with some prototype details. He was able to tell me that the buffers that I used would only be correct for the brakes and that the udnerframe only had two trusses, not the four that I have modelled. So some corrections will be required……………but first those transverse bolster springs and maybe give the carriage a bit of an outing (I will bring it to Scaleforum for that). 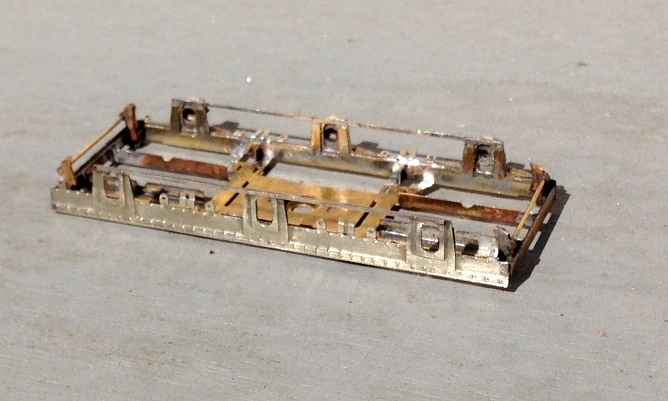 Posted on August 2, 2016, in Workbench (stock) and tagged Bill Bedford, Carriage, clerestory, East Coast Joint Stock, ECJS, eileens emporium, Model Railway, p4. Bookmark the permalink. 2 Comments. I looked at lockgroms web but could only find gogie kits. Does he sell the lost wax castings separately, and if so, which spring/axlebox do I ask for? Yes Andy Copp at Lochgorm does sell the castings separately, even if he does not list them as such. Drop him an email and he can advise.